As a pet parent, it's important to keep our pets safe. According to Collar ID, 66% of lost pets do not have any identification. If a pet has no form of identification and becomes lost, it makes it nearly impossible to reconnect them with their family again. Only 2% of lost cats and 22% of lost dogs are reunited with their families. My dog, Shiner, has fortunately never been lost before. My family did lose our puppy when I was a child, however. She did not have any form of identification when she was lost and we were very lucky to have her returned to us. A woman picked her up at the gas station next door where she found her and left her phone number there. Shiner and I were recently asked to review Collar ID - a custom pet identification cuff that you can put on any of your dog's collars. If your dog has a collection of collars and likes to wear different ones occasionally, it's easy to move the Collar ID to a different dog collar at any time. An added bonus is that the cuff is completely noise-free, so you won't hear the jingling and jangling of noisy pet ID tags. That noise is something that drives me bonkers, personally. Plus, dangling tags can sometimes be dangerous. They can get stuck on the carpet or other things and become a choking hazard for your pet. This has actually happened to a friend of mine before. 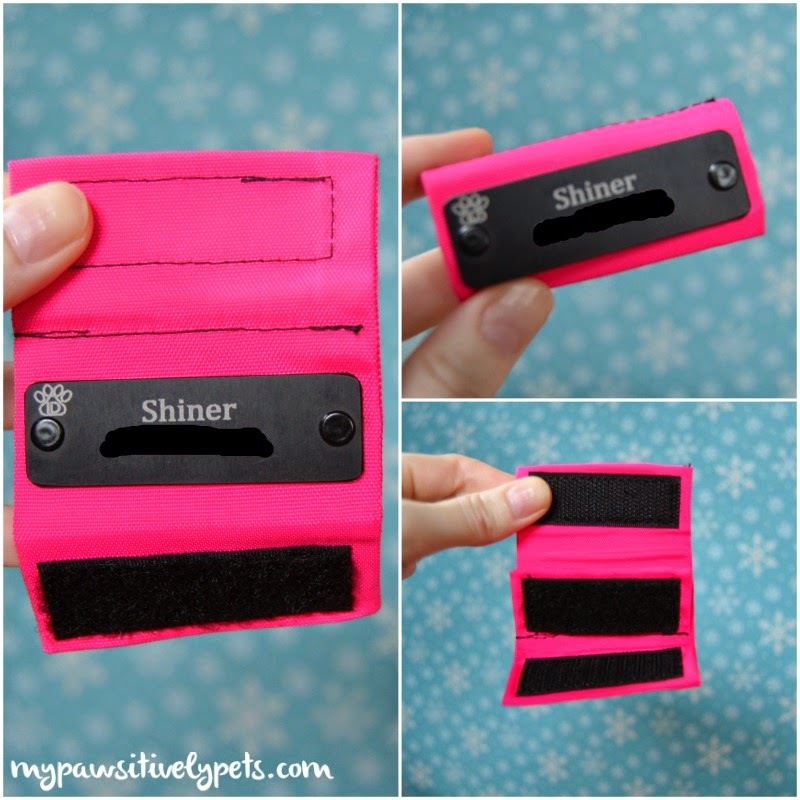 Our Collar ID includes Shiner's name and phone number. The phone number is blurred out here so we don't get any strange phone calls. The Collar ID pet identification cuff wraps around your dog's collar and stays put with a velcro closure. The cuff is durable and I think this is going to last Shiner quite a while. Collar ID is available in 4 sizes (because not all collars are the same width) and 6 different colors. Shiner is wearing a pretty pink Collar ID, of course. Shiner and I give the Collar ID four paws up and think it's a great choice for a pet ID tag. To order a Collar ID, you can visit their website here. UPDATE: Use the discount code "collarid30" at checkout to save 30% OFF your Collar ID purchase. This code is valid until 1/29/2014. Want a chance to win a Collar ID for your pet? We are teaming up with Collar ID to give away 5 custom Collar IDs to 5 different winners! This giveaway is open to US and Canada (except where prohibited by law), ages 18+ only. This giveaway will end on January 22nd at midnight, Central Time. To enter, simply fill out the Rafflecopter form below. Good luck! This post is sponsored by Collar ID. Pawsitively Pets only shares information we feel is relevant to our readers. All opinions expressed here are our own! Aw Wilheim is a low rider! I've never had the problem of tags dragging on the floor before. That's great. I have a bunch of jingling tags on my dog and she would love something like this. Oh, I love tags that wrap around or sit on the collar itself instead of dangling! The Collar ID looks really cool. Do you think the velcro will hold up well over time? Yea, the velcro is very sturdy. I think the whole thing will last over time. I guess I'll find out just how long! I don't expect any time soon though. This looks like such a pawesome product! Do they make them for cats as well? Yes - these are for cats too. They have different sizes available to match different collar sizes. I love the tag idea and I love tag charms at times but I think that little tag wrap around is really cute and the name is easily seen. So cute. I would like this because I think it's a fabulous idea and I know it would look great on my huskies! Twice now Dottie has almost lost her tags and another time they looped onto the couch fabric and she got stuck. This is an awesome product that would work great for her! Oh that happened to my friend's dog but she was at work and came home to find her dog stuck in the carpet by her tags. Scary! Sometimes my Rottie gets away from me and she has a chip but an ID would be nice. Looks nice, but Mom likes our jingles. We get naked at night, but during the day, she subconsciously tracks what we are up to by the jingles. We know lots of people don't like that noise which makes this perfect for them. I love trying new products with my dog. This looks like a great way for someone to contact me if ever lily and I are to be separated. I love this! My dogs have lost so many tags I could probably open my own tag store. Thank you for reviewing such a worthy pet product! 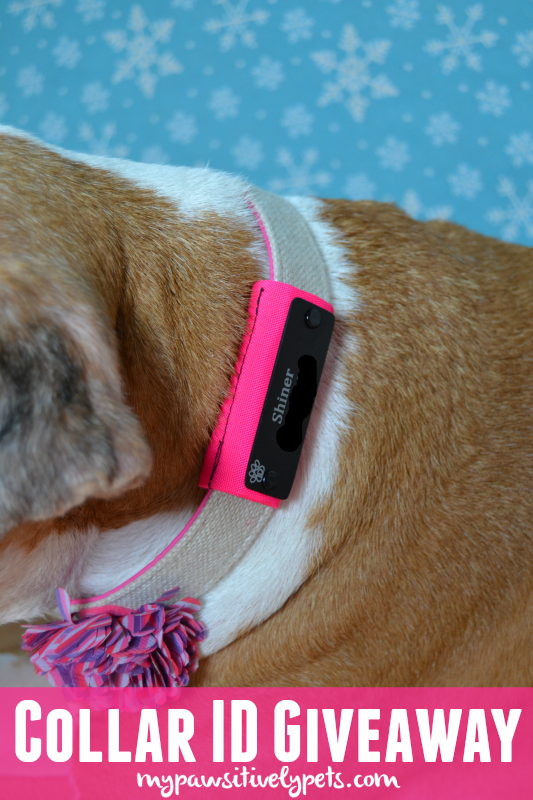 The collar ID looks like a great product for all pet parents. I think I will have to get one for our pup as well! I actually don't mind the jingling, I guess because I never have a collar on Bain when he is at home, only when we're out. I love the brightness to these, we'll definitely be entering! This is a cool idea! Our dogs' ID tags have come up missing more than once, so I am not comfortable relying on them. Our beagle Kobi used to escape every so often so I know how scary that can be....luckily he only went as far as the neighbors and at that time we had monogrammed collars which also worked well, so he always got returned home! That is a rather nice way to be safe instead of sorry! What a great idea. We don't like jingly jangly tags, either. 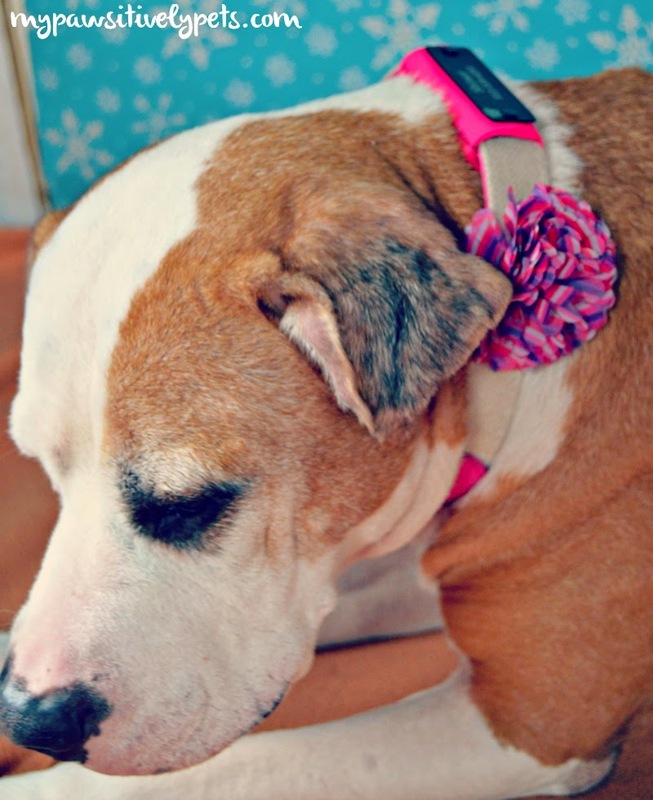 We have id collars that are sort of along these lines -- they are great! I would like to try it so it is easier to switch collars whenever we want. That is way cool and we have lost ours so thank you for the reminder to replace it. Have a wonderful Wednesday. oh we would like to win this at we don't like the jingling tags so we don't wear our collars, with these we would. I'd like one because I like to switch Rocket's collar. It will be a lot easier to change his identification with the velcro. That is a great idea although I am pretty sure brown dawgs would loose it in the higher cover they run in. I think it would be great for casual wearing. Maybe... I think it would be interesting to try it out in a situation like that. It really doesn't seem to want to budge. Cute and seems really comfortable to wear. Great concept. I'm always interested in any collar id that doesn't make noise. Great job on the review too! He has several collars and it would be convenient. We find the jingling tags can be quite annoying too. We recently got a collar for Harley that has our info engraved into it but would love to get a Collar ID for Charlie!